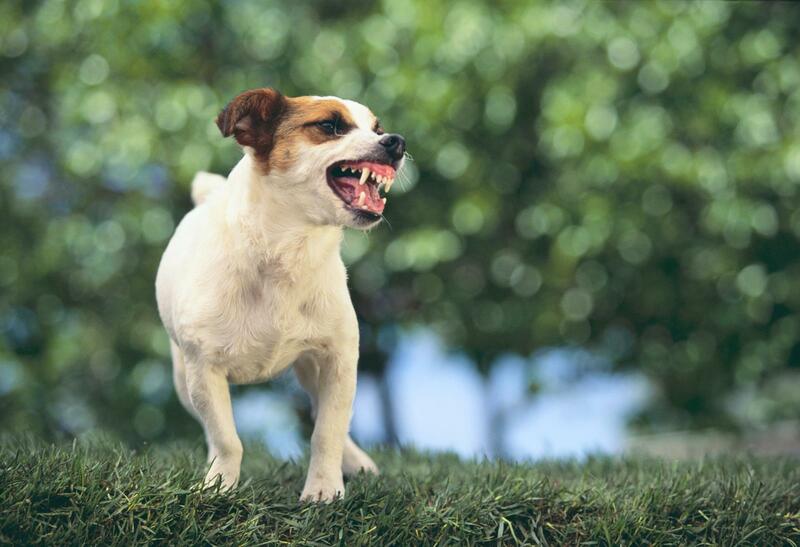 Dealing with an aggressive Terrier can be a challenge, but every dog benefits from learning its proper place in the pack. We have a six-year old Jack Russell/Beagle mix (Morgan) and a fifteen-year-old Golden Retriever mix (Heidi). We have watched and adopted Cesar Millan's methods because Morgan is a rescue dog with some behavior problems (these mostly have greatly improved since Cesar). In our house, we try to keep a firm hierarchy, with me as the alpha, my girlfriend the beta, then Morgan, then Heidi. Heidi is the polar opposite of Morgan; she has a very passive/submissive personality, so her being at the bottom is a natural function of our pack dynamic because she rarely challenges Morgan for anything. The issue is that Morgan has a very strong aggressive/dominant personality and seems to seek out opportunities to assert her dominance in the house. She guards food and food-related toys with a nasty viciousness. She is also incredibly stubborn; I consistently correct her whenever her behavior strays from the acceptable, but she is very challenging and often will try the behavior again on the off-chance she'll get away with it. Most of the time, at least in the house, this issue has been worked out. However, when our routine changes, either in having a dog come visit or going out somewhere where there are dogs, she becomes uncontrollable. She barks and snarls and pulls at the leash so much that she chokes herself with her front feet off the ground. Not only is it embarrassing, but we can't extinguish the behavior, so very often we have to either not take her or remove her from the situation entirely. She's gotten a lot better and I can control her somewhat using Cesar's methods, but she is so stubborn that when it's bad, the only option is to remove her. My first question is this: a relative is going into the hospital for cancer treatment and we are going to be taking care of her dog. Morgan doesn't have the best history when it comes to introducing a new dog and we're worried about what to do to make the transition easier and safer for everyone involved. She's actually a sweetheart beneath the behavior issues and she usually gets along fine with Heidi (which is to say, if Morgan were an aggressive mess, we would never dream of inviting the new dog to stay). We plan on using Cesar's method of introducing them outside and going on a pack-building walk before they're allowed to sniff each other, allowing Morgan to sniff first, etc., but is there anything else we can do once the dogs go inside? Secondly, because of Morgan's shady past, she seems to have some psychological damage, which we are trying to rehabilitate. She goes absolutely nuts when we're outside and she sees both people and animals, though after about a year of working on it, she has gotten a lot better about not barking at people, especially if I remind her before she starts. This is the one area where we're stumped; behavior outside the house. I have a sense that what she desperately needs is to be socialized with other dogs, but her behavior is such that I doubt she would ever be accepted into doggie day care, the dog park, etc. Even if she were accepted, I would be afraid of her getting into a fight with someone else's dog. What can we do to make her less aggressive toward other dogs and people? I happen to have a lot of respect for Cesar's methods. In order to teach a dog, you have to think the way he does. That's why Ceasar's methods are so effective. And as you probably already know, Cesar always says there's no magic timetable. You have to keep applying the corrections consistently until the problem behavior abates. It sounds to me as though your are doing this and that you've seen some improvement in Morgan's behavior. I think the pack building walk is an excellent way to begin the introduction between Morgan and your relative's dog. Don't forget to bring Heidi along as well. This way all the dogs can figure out where they fit in together. Once you're all in the house, it's going to be a different story because Morgan will still have her territory staked out. I'd suggest continuing the pack walk right into the house, making the same kinds of corrections as needed. I think it's also important to have an established place to keep the visiting dog with her own crate, food bowls, etc. Make this a room that Morgan normally has little interest in. Make sure you only bring the dogs out together when you are able to be there to give Morgan the correction. Honestly, I have Jack Russells too, and there is no way that I know of to totally quell those scrappy Terrier instincts. Yes, Morgan would be helped by more socialization with other dogs in neutral territory. You could do this by enrolling her at a local dog training facility. She would be evaluated by the staff first to assess her training needs and then be assigned to the appropriate class. I think she would benefit greatly from professional training. Keep up with the methods you're currently using and give the training class a try. I think the two combined will bring about more of the behavior changes you seek.